Today, I'd like to introduce Evernote! Evernote is a very useful tool intended for taking notes. It's brilliantly easy to use, free and available for many (mobile) platforms. I must admit: Evernote is my all time favorite tool. Although Evernote is not a typical developer tool, it helps me organize my thoughts, remember ideas, keep to-do lists and keep the piles of wasted paper under control! I hope that after this, you'll be tempted to try it out. 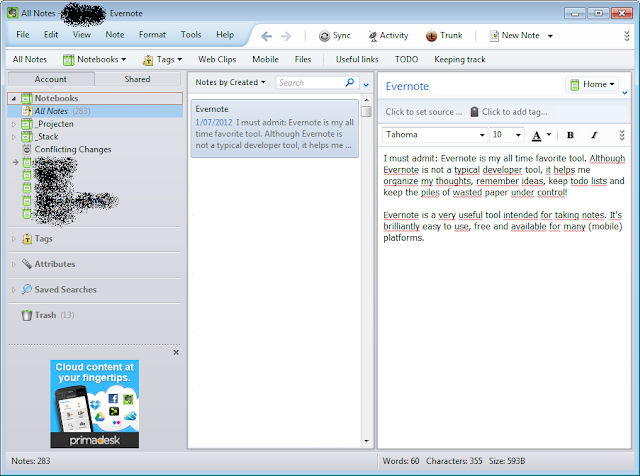 For example: I usually prepare my blogposts in Evernote. When I get an idea for a blogpost I create a new note with the idea as the title. I paste related links or images into the note and attach files to it as well. So by the time I have enough material for the blog post itself, I open the note and I'll have everything I've got. And while working on a project I use Evernote to write documentation and to create to-do lists with checkboxes. The great part about the application is that all these notes are stored in one place and are accessed through the application. So no loose files but everything stored in a searchable repository! You can also combine this with a PDF printer to print your notes in a nice format (more about this coming up). Another great part about it is that the developers of Evernote are constantely working on improvements and new ways to combinate Evernote with others applications or to use it in different ways. 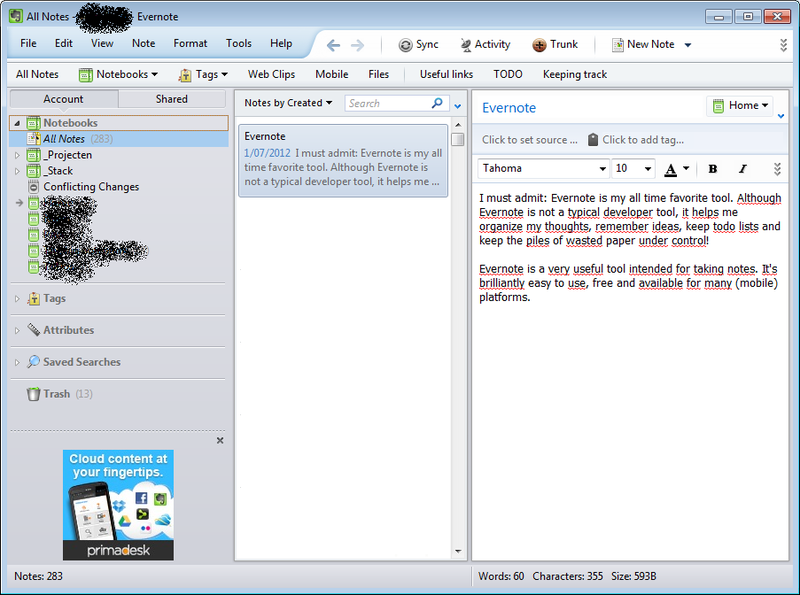 Let's take the tour: on the image below you can see the typical Evernote (desktop application) interface. The bar on the left is an overview of all the notebooks (collections of notes), list of all tags, list of all attributes and the trash which contains previously removed notes. As implied, you can tag your notes to group them accross all notebooks. The attributes are used to filter the list, there are attributes such as creation date, date last modified, contents, ... . You can also search by keyword or using the Evernote search syntax. The bar in the middle shows an overview of all notes in the selected notebook. Notes that match your search will displayed here as well. For the layout of this part of the screen, you can choose between List, Snippet and Thumbnail view to determine how the list of notes is shown. The example above shows the Snippet view in which you can read the first lines of text in the note. The bar on the right is the input for the note itself. You can completely hide the two bars on the left to increase the size of this bar. As you can see there are multiple options of formatting your text and metadata is implemented really good as well. But that's not all, what you see in the images above is the desktop application, but there is also a cloud version. You're notes are also available online and they are synced between the desktop application and the cloud. How frequently this is done, is for you to determine. You'll see a small pop-up that indicates that the desktop and online versions were syncronized. That's it for now, but I will continue to update this post because it will take me a while to describe all of the functionality of this tool. But for now, I hope this got you curious! For all other information and the download: http://evernote.com/!